Micro learning, resources not courses, campaign learning, user generated content…these are all trends in learning at the moment, but how do you put all the pieces of next gen learning together to create coherent and engaging learning experiences? To do this successfully demands a change in the way L&D implements and uses learning technology. Employee engagement has become an increasingly important focus for organisations. In fact, our current research tells us it is the leading measure of success for HR strategy today. Within L&D, the resulting impact of this is the need to become much more learner-centric and to proactively engage learners. No longer should training be something that is ‘done’ to your people! Rather, it should be an activity that learners actually want to get involved with. To truly understand learning engagement, we should start thinking about the through the lens of the learning cycle. By thinking about things in this way, we can begin to appreciate the opportunities that exist to engage learners. Then, we can start to evaluate how good solutions support each stage of the learning experience, wherever we start in the cycle. 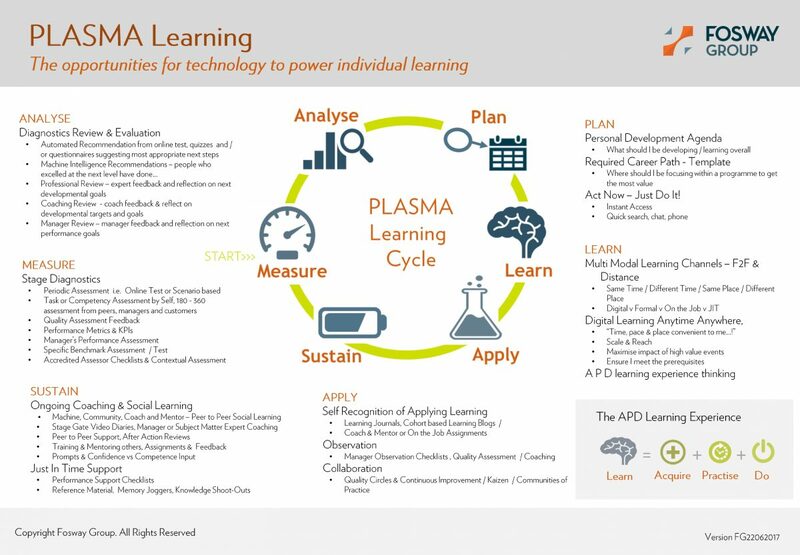 Now, you could create your own definitions for the stages of a learning cycle, but it will be much quicker using the one Fosway analysts have already prepared for you – the PLASMA model. How ready is your L&D set up to deliver learning experiences? Find out using our PLASMA checklist. And if you need to know more about how to action some of these ideas, or feel that some advice around making your learning solution selections could be beneficial, speak to one of our analysts today via +44 (0) 207 917 1870 or email info@fosway.com.